Cannot be Normal Summoned/Set. Must be Special Summoned by a card effect, and cannot be Special Summoned by other ways. During either player’s turn, when your opponent activates a monster effect while you control no monsters: You can Special Summon both this card from your hand and 1 “PSY-Frame Driver” from your hand, Deck, or Graveyard, and if you do, negate that activation, and if you do that, destroy that monster. During the End Phase, banish the face-up monsters Special Summoned by this effect. PSY-Framegear Gamma is another hand trap that has seen a huge rise in play in the last six months. Restricted slightly, needing you to be monsterless, but with the power to negate a monster effect and destroy a monster, Gamma does offer a one-for-one. In addition, you have to Special Summon PSY-Frame Driver with this monster via Gamma’s effect, but unless all your Drivers are banished, you have the ability to pull one from anywhere, balancing this restriction out. You lose both monsters at the end of the turn, so if you have no ways of bringing Driver back from banished you will be running a playset of both monsters. If you negate during your opponents turn you’ll be able to use the monsters before they get banished. Gamma negates and destroys while Veiler only negates. Strike negates and destroys like this monster, but costs 1500LP. The difference in these comparisons are the number of committed cards. Six vs three leaves three slots for other cards, and many decks want to keep the card number as close to 40 as possible. Several decks can play this card and Driver in sets and have success. It’s up to the player if they want straight-forward negation and destruction, or commit more cards for the same result. PSY-Framegear Gamma is a Level 2 Psychic-type Tuner monster with 1000 Atk and 0 Def. Gamma can’t be Normal Summoned or Set and Banishes itself and PSY-Frame Driver during the End Phase after using its effect. That effect is a doozy. You get to Negate and Destroy any opponent activated monster effect and Special Summon itself from your hand and Driver from anywhere except the banished zone. Using this during your opponent’s turn is good as an unexpected interrupt. Using it during your turn one against an opponent’s hand traps is almost unfair. Let’s say you activate ROTA and it gets chained by an opponent’s monster hand trap. Gamma would negate and destroy the hand trap and then Special Summon itself and Driver for an easy Synchro or Link Summon. If you get Omega, you can take another card out of your opponent’s hand. In PSY-Frames, you have the Field Spell to Synchro Summon during either turn, but if your opponent goes first, this is an inexpensive non targeting monster effect negater. Just have no monsters on your field which means it won’t negate Veiler. The worst part of this card isn’t this card but the Vanilla Driver you have to run to make the effect work. Starting off this week is the recently reprinted PSY-Framegear Gamma, a very popular hand-trap in the meta today. Gamma is a Level 2 LIGHT Psychic Tuner with 1000 ATK and 0 DEF. Stats are expected for a Level 2, being a Tuner is great though. LIGHT is a great attribute and Psychic is a good type on a Level 2. This card cannot be Normal Summoned or Set, meaning you must Special Summon this via card effect. During either player’s turn, when your opponent uses a monster effect, you can negate that effect and destroy that card, then you can summon this card from the hand and a PSY-Framegear Driver from the hand, deck, or GY. That effect can only be used while you control no monsters. That is basically the PSY-Frame archetype, you use the monsters in the hand to negate specific effects or actions, then use the Tuner and the Driver to go into a PSY-Frame Synchro to let that leave the field with their effects and use another PSY-Frame Tuner effect. Gamma has seen play in other decks as well in triplicate along with a Driver to negate important monster effects from the opponent, and if you did it on your turn, you can go into an Omega. If you use this on the opponent’s turn, you have to rely on PSY-Frame Circuit for a Synchro Summon, otherwise the Tuner, in this case Gamma, and Driver will be banished during the End Phase. PSY-Frames are a solid deck, and some of those Tuners can be splashable if you want to try something different, we have already had success with Gamma, so maybe other Tuners like Delta and Epsilon could have a good future. Art: 4/5 A part of Omega I assume? PSY-Framegear Gamma. This is an interesting enough card, and one good for Psychic players, as well as being moderately splashable (with other PSY Tech) perhaps as Tech in other Decks. But at the very base here, we have a Level 2, Psychic, Tuner Monster, with 1000 attack (not awful for Level 2) and 0 defense. This card can only be Special Summoned by a card Effect (think we dealt with this last week) and not Normal Summoned or Set. You have the freedom of being able to do this during the turn of either player, for a plus. It does have to be a Monster effect activate by the opponent, and you have to control no Monsters, but this isn’t exactly one of those cards you have to set up to be like that for either. 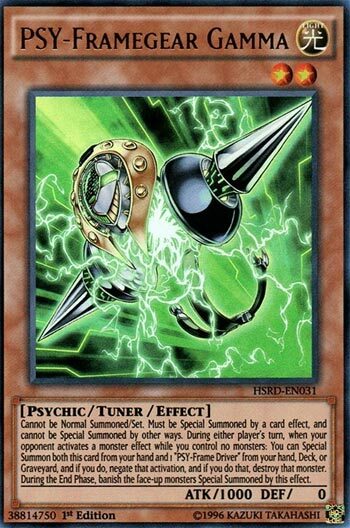 You get to Special Summon this card and a PSY-Frame Driver, and you want to Synchro them (or something ASAP) as these get removed from the Field during the End Phase you bring them out. Frame Driver has the bonus of being able to be fetched from Hand, Deck, or Graveyard, and if you’re successful in bringing these cards out via response to opponent’s Monster effect, said effected is negated and card is destroyed. This is more or less a 1-for-1, assuming it all works, and you get to trade your two in for a Synchro. Negation and destruction are good, as is the defense this provides, or even the offense it can as well.